We have compiled a list of dental keywords commonly used by dentists and throughout our platform for your reference. If you come across other terms you are not familiar with, feel free to reach out to us or your Denteractive™ dentist of choice. Medical term for the lower jaw, which holds lower teeth in place. Medical term for the upper jaw, which holds upper teeth in place. Description of second set of dentition, which appear at about 6 years of age and usually consists of 32 teeth. Some people may have congenitally missing teeth. Transition of primary teeth to permanent teeth, usually starting at age six. There are many numbering systems in dentistry. The most common system designates teeth #1 through #32 for permanent dentition. 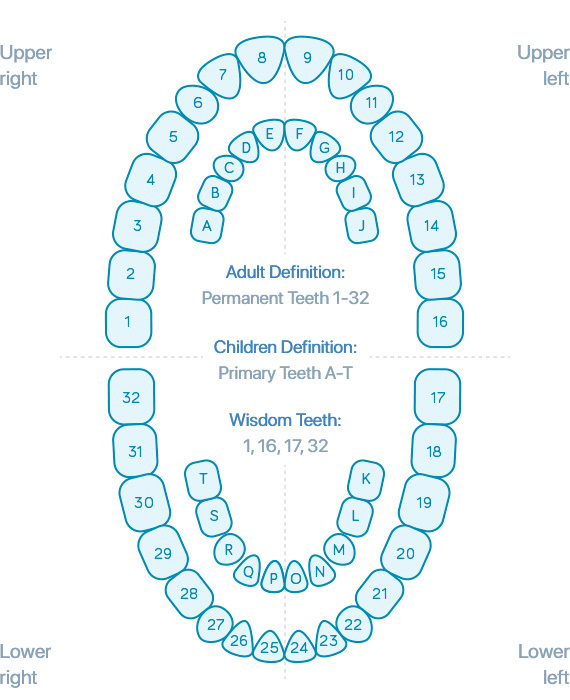 In this universal system, tooth numbers start from #1 in the upper right quadrant of the mouth, to #16 in the upper left, and then it follows from lower left #17 to lower right #32. In kids with primary /deciduous teeth, the tooth designations are described by letters: starting with letter A on the upper right and ending on letter J on the upper left, and then follows with letter K on the lower left and ends in letter T on the lower right. Describes the four upper and lower front teeth in both primary/deciduous and permanent dentition. Also known as cupids, or “eye teeth”. There is two in the upper (maxillary) and two in the lower (mandibular) arch. It is present in both primary/deciduous dentition and permanent dentition. Also known as bicuspids, these are transitional teeth located between canines and molars. There are usually eight premolars, two in each quadrant. These teeth are only present in permanent dentition and usually replace primary molars in kids around the age of 9-12. The most posterior teeth in the mouth. Molars are very important in the function of chewing. There are usually 12 molars in the mouth, with 3 in each quadrant, including the wisdom teeth. The most posterior of the three molars, which appear in the mouth between the ages of 17 and 25. Some people have impaction of wisdoms, or are missing their wisdom teeth all together. The outer hard (mineralized) surface of teeth that naturally caps and overlies the inner dentin layer of the teeth. The deeper, less mineralized portion of the tooth that lies between the outer enamel layer and the inner pulp. Within the roots of teeth, the dentin is covered by a thin layer called cementum. Center of the tooth made up of blood vessels and nerves, and exhibits some regenerative properties in some cases. Thin calcified layer covering the root surface of a tooth. This layer is essential for healthy root attachment to periodontal ligament within the bony housing (Alveolus). Bony housing around the teeth within the jaws. Delicate tissue fibers that attach the tooth to alveolar bone. Bone that encompasses the tooth socket and holds the teeth in place. Anatomic cavities, or air spaces, that are located above the upper posterior teeth. Anatomic bony plate that is located on the roof of the mouth which connects the upper jaw alveolus to the maxilla. Soft tissue behind the hard palate which ends in the uvula and functions in sound and phonetics. Soft tissues that is located and hanging from the posterior soft palate. A fold of soft tissue that connects the lips, to the gums overlying the alveolar bone in several points in the mouth. This attachment is mainly seen on the gums close to two upper or lower front teeth. A fold of soft tissue that connects the tongue to the mucosa at the floor of the mouth. TMJ/Temporomandibular Joint: The “hinges of the jaws’. This is the joint that attaches the lower jaw to the upper jaw. It mainly consists of: the condyle or bony extension of the lower jaw, the bony housing of the upper jaw, a soft tissue disc between the bony union, and, several ligaments and tissue fibers that encapsulate the area for protection. Dental decay and breakdown of teeth due to bacteria. Disease that affects the periodontal tissue. Increase in size of gingiva. Also known as hyperdontia; these are extra natural teeth that appear in addition to primary or permanent dentition. Congenital absence of one or more teeth which results from disturbances during the initial stages of tooth formation. Disorder associated with the TMJ apparatus. This includes disorders of jaw muscles; ligaments and attachments; and the disk that usually offer stabilization of this joint. Pain not related to teeth or obvious facial structures. This includes certain Neuralgias or pains unrelated to teeth or related oral and facial tissues. Usually marked by excessive “Snoring” , it is a sleep disorder when there is absence of breathing during sleep. It can create several health risks. Collection of pus that has built up within the tissues of the oral cavity or around auxilliary tissues of the face. Device that allows visual communication between patient and dentist. Examination of a tooth by transmitting an indirect light through it to helps detect decay or cracks. Drug that produces temporary, local or general loss of sensation. Administration of oral sedative drugs to help reduce patients fear and anxiety. Also known as the laughing gas, Nitrous oxide is a gas with a sweet odor and taste to reduce anxiety during dental treatment. It is combined with safe doses of oxygen while being administered. Using drugs or gases under a controlled and safe environment to temporarily put people to sleep for a dental procedure. Practitioner who has training in all aspects of dentistry. Deep cleaning that removes or eliminates dental plaque, and calculus, which helps eliminate periodontal disease. Procedure used to remove stain, plaque, and calculus from the clinical crown of tooth. Tarter/calculus: hardened plaque that accumulates on teeth. A biofilm that develops naturally on the teeth. It is accumulation of debris and bacteria that attaches to smooth surface of teeth. Also known as “Silver fillings” is a metal alloy, which has been used as dental filling material for many decades. Resin filling material used in dentistry to restore cavities. Protective dental restoration that completely covers the visible tooth structure in the mouth. The materials used to fabricate crowns may be metallic, porcelain, or a combination of porcelain fused to metal. Dental restoration used to replace a missing tooth or teeth. They are made by prosthetic joining permanent teeth on either side of a missing space. Indirect restoration consisting of either gold, porcelain, composite resin, that is cemented into the tooth where the cavity was removed. Layer of material (porcelain or composite) placed over a tooth to help improve the esthetic of the tooth. Removal of tooth from the oral cavity. Also known as “False teeth”, are prostheses that are used to replace missing teeth; and are supported by soft and hard tissues of the oral cavity. Removable appliance that restores teeth in a partially missing dental situation. An adhesive filling material placed at the neck of the tooth to help decrease sensitivity and fill the area. Technique used in dental restorations to help preserve the health of the dental pulp after being exposed during cavity preparation or after deeper tooth fracture. The use of chemical agents to lighten tooth discolorations. Drug that produces local or general loss of sensation. Also known as “laughing gas”. Nitrous oxide, most often used with Oxygen, is a gas with a sweet odor and taste used as an analgesic and sedative agent. Dental Specialist who has limited practice to braces and movement of teeth, and, achievement of facial balance and symmetry. First set of braces placed during mixed dentition to correct discrepancies and help minimize more extensive orthodontic treatment in the future. Conventional braces placed once all permanent teeth are fully erupted. Misalignment between the teeth of the upper and lower jaw. Malocclusion due to inadequate anatomic arch space to accommodate the teeth in proper alignment. Removal of interproximal enamel to facilitate alignment of crowded teeth. Form of malocclusion when a single or multiple teeth are in an abnormal position in relation to the opposing tooth/teeth. Measurement of the vertical overlap of the upper front teeth over lower front teeth. No vertical overlap of the upper and lower front teeth. It usually shows as a gap between the upper and lower front teeth. Natural spacing between teeth. It is most common between upper or lower front teeth. Custom-fabricated clear retainers used for straightening and realigning teeth. Small metal attachment bonded to teeth and used to hold the Orthodontic wire for tooth movement. An instrument used to wedge teeth apart and out of normal contact by immediate separation. Removable appliance designed to stabilize teeth after braces. An appliance that increases circumference of the dental arch by gradual mechanical movement of upper jaw segments. An orthodontic appliance that encircles the head and neck and is attached to dental braces and the chin to help correct or prevent severe bite problems. Panoramic Two-dimensional dental x-ray of the upper and lower jaw. X-ray analysis of dental and skeletal relationship, and used to diagnose facial growth abnormalities. A dental specialist who limits his practice to children’s dentistry. Procedure used to remove stain, plaque, and calculus from the clinical crown of teeth. resin/white material used as dental fillings. Modified resin material used as transitional fillings in primary dentition. These usually release fluoride with time to reduce chance of recurrent decay. The complete removal of vital diseased tissues from the pulp chamber of teeth to reduce pain and prevent further infection. The complete removal of the pulp from the pulp chamber and root canals. silver crown used for the restoration of broken-down primary teeth and some permanent teeth. Porcelain esthetic crowns used for restoration of primary teeth. Composite esthetic crowns used for restoration of primary front teeth. Fixed or removable appliance designed to preserve the space created by the premature loss of a tooth. Fixation of a tooth to the jaw bone resulting from fusion of the cementum and alveolar bone. also known as the laughing gas. Nitrous oxide is a gas with a sweet odor and taste, which is mainly used along with oxygen as an analgesic and sedative agent. A dental specialist who deals with the supporting structures (gums, connective tissues and bone) of teeth. Surgical excision of unsupported and inflamed gum tissues. Surgical procedure to re-contour supporting gums and bone tissues around a decayed or deeply fractured tooth, to expose more of the healthy tooth structure crown to help better restore the tooth. A corrective surgical procedure that involves harvesting a thin strip of tissue from palate to provide a stable gum tissue around a tooth or implant. Usually a titanium screw or fixture is inserted into the jawbone, which will support a dental prosthesis such as crown, bridge, and denture. A dental Specialist who focuses on difficult restorative cases and full mouth reconstructions. Dental restoration used to replace a missing tooth or teeth. They are made by prosthetic joining of permanent teeth on either side of a missing space. The process of rebuilding, realigning or restoring all of the teeth in both the upper and lower jaw into proper occlusion and esthetics. A surgeon who treats injuries and defects of the head, neck, jaw, and face, and the soft tissue of the oral region. Surgical procedure that replaces missing bone usually a variety of natural and synthetic products. It usually precedes an implant procedure. Removal of a tissue or other material from the living body to establish a diagnosis. Usually a titanium screw or fixture is inserted into the jaw bone, which will support a dental prosthesis such as crown, bridge, and denture. Usually a wisdom tooth condition where the tooth is partially covered with bone and soft tissues. This problem often requires bone removal or tooth sectioning during extraction. Usually a wisdom tooth condition where the tooth is completely covered with bone. Treatment often requires the surgeon to reflect soft tissue flap and remove bone in order to extract the tooth. Nerve bundle that runs under the roots of lower teeth and serves sensation to the tissues of the chin, lower lip, gum tissues, and teeth of the mandibular jaw. Extension of the inferior alveolar nerve, it provides sensory innervation to the tissues have the chin and lower lip, and feeling to lower premolars and anterior teeth. A surgical, implant based prosthesis procedure used in patients who are edentulous. It involves placing four implants in both upper and lower jaws, and then building a fixed denture that attaches into the implants for support. Jaw Surgery to alter and anatomically improve the relationships of teeth and opposing dental arches. Injury of tooth-supporting structures without abnormal loosening or tooth displacement. Injury of tooth-supporting structures with abnormal loosening but without tooth displacement. Partial displacement of the tooth out of its alveolar socket. displacement of the tooth axially to one side. Displacement of the tooth into the alveolar bone. The tooth is completely displaced out of its socket. A fracture to the enamel with loss of tooth structure. A fracture to enamel and dentin with loss of tooth structure, but not involving the pulp. A fracture involving enamel, dentin and cementum with loss of tooth structure, but not involving the pulp. A fracture involving enamel, dentin, and cementum with loss of tooth structure, and involving the pulp. A fracture to the root of the teeth involving cementum, dentin, and the pulp. A fracture of the alveolar process. A fracture involving the base of the maxilla or mandible and often the alveolar process. A Dental Specialist who limits his practice to root canal therapy and surgical repair of roots. A fracture that involves the root of the teeth and affects the dentin, pulp and cementum. Vital pulp therapy performed to allow physiologic development and formation of the root end. The complete removal of tissues within the pulp chamber. The complete removal of pulp tissues from the pulp chamber and root canals of a tooth. Removal of a small diseased portion of vital pulp to preserve the remaining coronal and radicular pulp tissues. thin, rectangular sheet used to isolate the operative site from the rest of the mouth. also known as the laughing gas. Nitrous oxide is a gas with a sweet odor and taste used with oxygen as an analgesic and sedative agent. loss of protective reflexes resulting from the administration of one or more agents. Surgical removal of the root tip is removed and a root end cavity is prepared and filled with a biocompatible material. Surgical division of a multi-rooted tooth. Removal of one or more roots of a multi-rooted tooth. Conservative endodontic procedure to promote healing and normal. A natural rubber filling material used during root canal procedure. Mineral Trioxide Aggregate is a biocompatible root filling material used during surgical root end filling placement, or root repair during resorptions or perforations. Aseptic cleaning, shaping and sealing of internal root spaces to control inflammation, pain; and to prevent spread of infection. Reinforcement placed within the root of a tooth after a root canal procedure to help resist loosening of the crown. It is mostly used when there is weak remaining tooth structure due to preexisting decay or fracture. Posts could be metallic in nature or plastic based.